This is my very first crochet pattern. Lemmy Koopa is one of the Koopalings from the Mario games. I made him for my brother’s birthday. He’s about a foot tall. My abbreviations make sense to me, but I understand that they might not make sense to everyone. Please comment if you have any questions. If you’d like to share this pattern, please link to this page or the corresponding Ravelry page. I used mostly Red Heart Super Saver (or similar) and an H hook. Any yarn weight and hook should work. You’ll also need a yarn needle and some fiberfill. *…*nx: do n times or repeat for the whole round if no number is given. Notes: When switching colors, use the new color for the last YO of the previous stitch. The loop on the hook should be your new color when you’re about to start the new color stitch. For all pieces that need to be stuffed, stuff firmly a few rounds before the final round. FO, leaving long length of yarn. Sew body to head. FO and sew to front of body. FO and sew to back of body. Flatten (without stuffing) and sew to front of head. Flatten thighs and stuff lower legs. Sew flat onto sides of body. FO and sew to legs using tail yarn. Sew hair pieces to head as shown in pictures. FO and sew to side of head. FO and sew to sides of head as shown in pictures. Draw up an off-white loop in the center of the shell and make another point and fasten to shell. FO and sew to back of head. 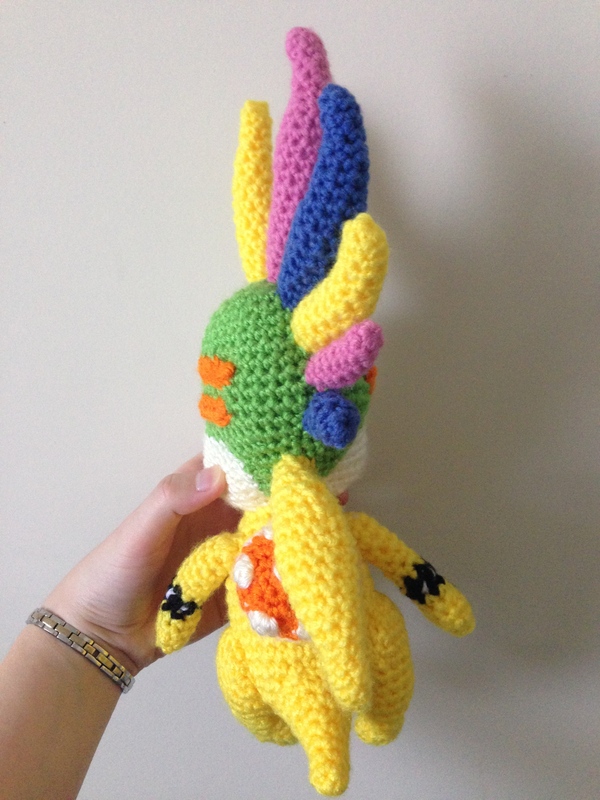 This entry was posted in Crochet and tagged amigurumi, crochet, free, koopa, lemmy, mario. Bookmark the permalink.